Every year, children in Gaza and the West Bank are taught to hate Jews and Israelis, while Israeli schools promote coexistence. A bizarrely biased, State Department-funded study won’t change that fact. Despite the media presentation, however, something about the study, and the media reports on it, didn’t ring true. As a product of more than a decade of Israeli schools I can attest to the fact that the Israeli public education system certainly has its share of problems. But of all the issues—ranging from crowded classes to plummeting standards—one thing I never encountered was ignorance or hatred of “the other side.” Indeed, this is true of Israeli society in general. Even a surface-level familiarity with Israeli culture and academics provides enough information to know that the Palestinian perspective is represented in the arts and media and factored into the Israeli political process and legal system. Faced with a purportedly objective study that completely contradicted my own experience with the Israel’s education system, I felt compelled to examine the report in depth. What I found isn’t pretty. The report is not only flawed, but also dishonest. It systematically exaggerates the faults in Israeli textbooks and downplays those found in the Palestinians’. Its methodology tends to distort the raw data rather than analyze it, usually to the detriment of the Israeli education system. Put simply, it makes every possible effort to create the impression that Israeli and Palestinian attitudes toward each other are the same, even when this is demonstrably untrue—according to the study’s own research data. It is no surprise that the State Department, which funded the study in its early phases, has endorsed neither the composition of the committee nor the report’s findings. This is an important issue, not only because of the need for scientific accuracy in such studies, but because the presentation of “the other” in Palestinian and Israeli texts is an absolutely essential topic. In many ways, it is the essential question in regard to the Israeli-Palestinian conflict: Are both sides building societies that can sympathize, or even empathize, with “the other”? If so, it could mean an (eventual) end to years of war. If not, then we may well be facing decades of further violence and the absence of any lasting peace between Israel and the Arab world. We can begin from the beginning: the introduction to the report, where the authors note that guiding the Israeli education system is an official stated objective that explicitly includes educating Israeli children about the other. According to the government of Israel, the purpose of Israeli’s education ministry is to teach “universal values and the values of the State of Israel” while giving students an “acquaintance with the culture and heritage of the Arabs.” According to the report itself, the statement of objectives by the Palestinian Authority Ministry of Education never mentions the words Jews or Judaism. Given the overarching conclusion of the report, one would expect that this discrepancy would at least been addressed by the report. But for the length of the report it goes unmentioned. When it comes to aesthetics—the presentation of maps, photos and graphics found in textbooks—the same issue pops up right off the bat. The study examined photographs and illustrations in the textbooks “when people, symbols or places clearly associated with the ‘other’ were present.” But crucially, the report’s data indicates that only seven percent of the photographs in Palestinian textbooks contain photographs of the “other”—compared with 52 percent of photographs in Israeli textbooks. The conclusion the authors draw from this striking and seemingly obvious discrepancy? Faced by this issue, the report simply states that “the very small number of photographs in the Palestinian books rated as providing information about the other makes the percentage breakdown of little meaning.” While the sample size might make the “percentage breakdown” of little statistical value, the fact remains that when Palestinian students opens their textbooks—even to pages that reference places in Israel—they almost never see a photo of an Israeli, and never humanize Israelis. Perhaps more than any other part of the Victims report, this section covering the portrayal of religion seems the most biased. In these cases, the authors not only ignore passages from Palestinian textbooks that are hostile toward “the other,” they ignore cases of outright anti-Semitism, hatred, and incitement to violence. A second methodological point concerns the choice of school systems included in the study. The report goes a long way to include analysis of ultra-Orthodox, or Haredi, school texts in its breakdown of the situation. Unsurprisingly, it finds that Haredi textbooks are more problematic than their secular counterparts. But bizarrely, the report itself states that the Haredi system is independent of the Israeli public school system and its textbooks are “not subject to approval by the Ministry of Education.” This raises the question of why the authors made Haredi textbooks a key part of the report. Why would the report include ultra-Orthodox schools but not Hamas ones? The study portrays the Haredi system as essentially equal to that of the mainstream Israeli system and the Palestinian system. In all charts and discussions, the three systems appear next to each other and appear to be granted equal weight and importance. But, as the report’s authors are surely aware, the Haredi school system accounts for—at most—a quarter of Israeli Jewish students. Haredi textbooks, in other words, are certainly worthy of analysis, but they tell us next to nothing about mainstream Israeli attitudes toward Palestinians. This, however, is not the biggest problem with the discussion. For while the report places such importance on the Haredi system, it also completely ignores the Hamas-run school system in Gaza. Though these schools comprise a small number of Palestinian schools—and less than the percentage of ultra-Orthodox schools in Israel—they must merit analysis. In other words, an extreme religious school system in Israel is given equal standing with the secular majority, while a more extreme (and much more violent) religious school system on the Palestinian side is effectively erased. One of the main findings of the report is, indeed, that Israel’s state school system textbooks are in fact less problematic than Palestinian texts. “While present and problematic in all school systems, the negative presentation of the other, the positive non-critical presentation of the self and the absence of images and information about the other are more pronounced in the Israeli ultra-Orthodox and Palestinian school books than in the Israeli state school books,” both the report and its press release state. By including the ultra-Orthodox school system in their conclusion, the authors set out to create the semblance of an equivalence between Israeli and Palestinian textbooks even though their research shows something entirely different. The heading obviously indicates that both sides share the problem in “common.” But it’s unclear precisely why the authors chose this title, since their own data completely disproves it. The report itself states that “the other” is portrayed in positive or neutral terms in 51 percent of Israeli textbooks, but only 16 percent of Palestinian textbooks. “The other” is portrayed in negative terms in 49 percent of Israeli textbooks, but a stunning 84 percent of Palestinian texts. 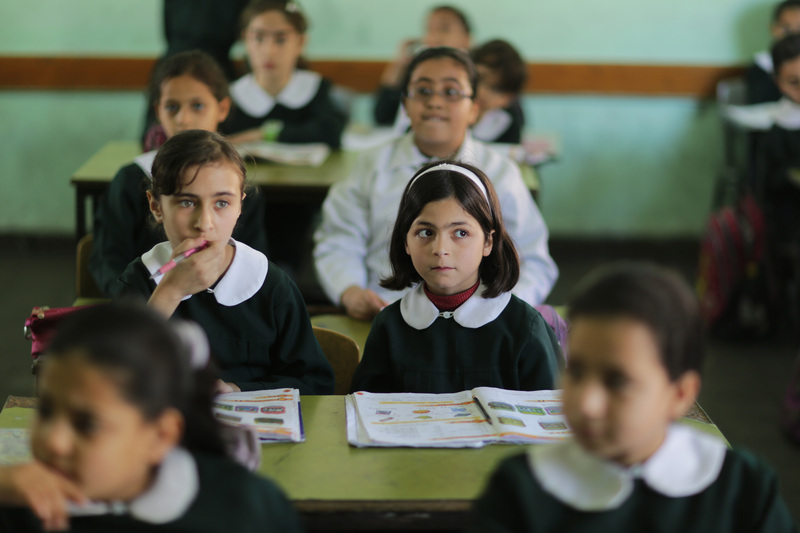 Do Palestinian teachers prepare children for coexistence? Lessons in Gaza City. The section on “Characterization of the Acts of the Other” reveals almost the same results. 48 percent of Israeli textbooks characterize Palestinian “acts” in “very positive (superior), positive, or neutral” terms. In Palestinian texts, only 12 percent of cases studied portray Israeli “acts” in a positive light. When it comes to portraying acts as negative, Israeli texts are roughly balanced against those presenting positive, with 51 percent of Israeli textbooks showing acts as negative. 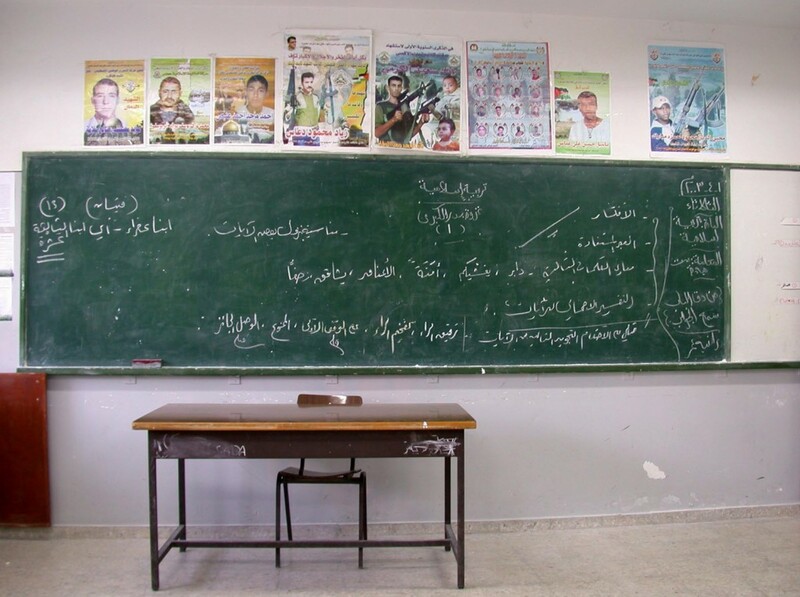 On the Palestinian side, the negative characterization of Israeli acts is, once again, overwhelming with 87 percent of Palestinian textbooks presenting them in a negative light—according to the study. In almost 9 out of 10 cases, that is, Palestinian textbooks depict Israeli actions in a negative way. The report makes every effort to show that Israeli and Palestinian attitudes toward each other are the same, even when the study’s own data shows the opposite. The following divine books: 1 – “The messages of Abraham (peace be upon him) and Moses’ call for belief in God Almighty, worshipping Him, and following noble morals.” 2 – The Torah: Was revealed to Moses (peace be upon him) to guide the children of Israel. 3 – The Zabour: Was revealed to David (peace be upon him) with sermons and guidance for the children of Israel. 4 – The Gospel: Was revealed to Jesus (peace be upon him) to guide the children of Israel, and to reaffirm what Moses (peace be upon him) had brought. As should be obvious, this example is completely meaningless. It is purely religious in nature; it has no relation to the Israeli-Palestinian conflict; in fact, it says nothing whatsoever about Israelis or any modern-day Jews at all. In contrast, Israeli textbooks depict concrete actions taken by real Palestinians within the context of the conflict. The conclusion to this section is thus very strange. It claims that “positive characterizations of Arabs or their actions in Israeli state books typically refer to individuals rather than to Arabs as a whole or as a nation.” Yet it fails to mention that the only citation from a Palestinian textbook refers to neither individuals nor a nation in the modern sense, but only to ancient religious precepts. The report correctly identifies the issue of self-criticism as one critical to understanding an education system, tacitly acknowledging the fact that a capacity for self-criticism is essential to any free society, and equally essential to ending a long-running conflict. Recognizing its own sins allows a society to see the humanity and suffering of “the other,” and thus take concrete steps toward reconciliation. A nation of immigrants has to encourage tolerance. An Israeli school in Jerusalem. Omar’s policy with his subjects is an example illustrating how careful Islam is to guarantee subjects’ rights and provide them with a dignified life whatever their religion. When Omar saw an elderly Jew begging because of his poverty and need, he (may God be pleased with him) told him: “We were unjust to you, we took the jizya (poll tax) from you as a young man, and then we abandoned you in your old age.” Omar ordered that he and those like him be spent for out of Islamic charity money. As before, the examples taken from Israeli textbooks deal with concrete actions taken by the modern State of Israel in the current Israeli-Palestinian conflict. In contrast, the Palestinian text deals with actions taken approximately 1,300 years ago by a Muslim ruler who was not a Palestinian. (Omar hailed from Mecca.) It’s impossible to see how this is related in any way to the Israeli-Palestinian conflict, let alone the Palestinians’ portrayal of their own society. Indeed, the reader can be forgiven for thinking that, if better examples had been found, they would have been cited instead. And if this is the best the Palestinian education system can do, one would think the authors of the report would note it. But they don’t. In Jerusalem, a city which is considered holy in all three religions, there are praying buildings [sic] with domes—of Jews, Muslims and Christians. Among the buildings with domes in the Old City: the Dome of the Rock, the Al-Aqsa mosque of the Muslims, the Church of the Holy Sepulcher of the Christians, the “Horva” Synagogue of Jews. In the context of recognizing “the other” and advancing the cause of peace, the Israeli text’s recognition of the sanctity of Jerusalem—one of the politically hottest and emotionally most stirring issues for Israelis— to non-Jews is, to put it mildly, significant. It’s strong enough a point to think that a presentation of Jerusalem in this way could even pave the way for compromise on sovereignty over the Old City. There is no parallel Palestinian text presented by the study. Of the textbooks surveyed, there was no mention, not even in passing, that Jews regard the Temple Mount as sacred. Instead, this is one of the texts cited by the study as proof of Palestinian presentation of religious understanding regarding the conflict: “The Jews kept Saturdays’ sanctity and they made it a day for rest and prayer, and they forbid all the work in it, even the work for good, and by healing the patients on Saturday Jesus taught us that the work of goodness is mandatory all the days even in Sunday.” In contrast to the Israeli text, this has no connection to the conflict and no national or territorial meaning. When one puts the media hype aside and examines the Victims study in full, one almost gets the feeling that the authors didn’t read their own report. In the face of overwhelming data, collected by the authors themselves, the report reaches the baffling conclusion that both sides embrace “unilateral and exclusive national narratives” and that “both Israeli and Palestinian school books forcefully and consistently establish distinct unilateral and opposing narratives.” Throughout, they claim, the textbooks show “a lack of recognition of the presence and absence of information about the other.” Contradicted by report’s own data, these conclusions are simply unsupportable. There is a clear and commendable reason that the U.S. State Department funded a study about textbooks used in schools 6,000 miles away. The idea that open-minded and tolerant education can advance peace between Israel and the Palestinians in the long term is both inspiring and realizable. In this sense, the study itself is a very positive step. But the analysis and interpretation of the findings, and the way they were presented to the public, were a distortion of the truth. In this the authors of the report failed to meet the State Department’s most important goal—promoting and advancing peace.